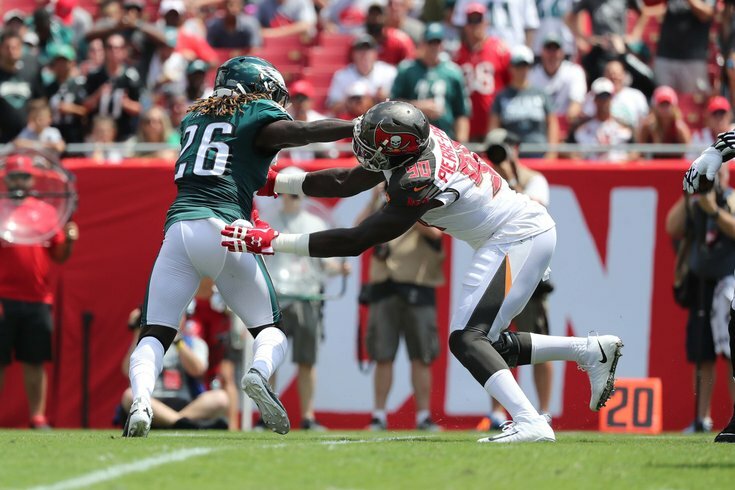 Philadelphia Eagles running back Jay Ajayi stiff arms Tampa Bay Buccaneers defensive end Jason Pierre-Paul (90) during the first quarter. A healthy Eagles' roster is the best NFL team on paper. But we haven't seen a healthy Eagles team, really, in almost a year. Eagles are playing without: Carson Wentz, Jason Peters, Jay Ajayi, Darren Sproles, Alshon Jeffery, and Mike Wallace. The Eagles lost Jay Ajayi on their first drive, and later Jason Peters (who missed a big chunk of 2017) and Mike Wallace early against the Buccaneers. Jay Ajayi headed to the locker room. Eagles down to Corey Clement and Wendell Smallwood at RB, for now. UPDATE: Ajayi returned to start the third quarter. Mike Wallace, ankle, questionable to return. Big V is at left tackle. Jason Peters is standing on the sidelines and looks OK. Wonder if they're just rotating him out for a series because of the heat. None one from the trio of players had entered the game by the gun after the first quarter ended. Luckily, some good news is on the horizon as reports say Carson Wentz has a good chance of returning in Week 3 against the Colts. Wallace was later ruled out with Peters still hoping to get back in the game. Injury Update: T Jason Peters (quad) is questionable to return. Mike Wallace has been ruled out. UPDATE: Jay Ajayi returned in the second half, contributing a 20-yard run on his first carry since leaving with a back injury.